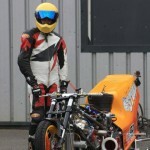 STOLEN: Lorcan Parnell’s race leathers, helmet, gloves and boots were stolen from his car in King’s Lynn on Saturday night (28th June 2014). 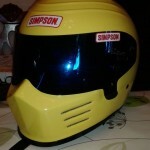 The helmet is a Simpson “Outlaw” Stig style helmet in very rare Corvette yellow with an ACU sticker (not standard) on the rear and an iridium visor. Probably the only one of this pale yellow colour in the UK, so very distinctive. 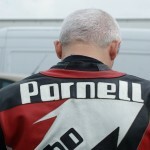 The custom-made Scott leathers are in red/white/black with “Parnell” and “turbo” on the back. Unique, and even if you tried to remove the lettering the stitching holes would still be visible. The Sidi boots have extra toe sliders glued on the inside of the foot for drag racing, as well as the outside as usual, and the gloves are red, black and silver. All were in a blue “Head” branded holdall. Please share this page and tweet with all bikers especially in Norfolk/Cambs area. A reward is offered. Contact Lorcan on 07947 569920 or lorcan@750turbo.com or Police 101 or Crimestoppers with any information please. This entry was posted in Uncategorized by Lorcan. Bookmark the permalink. Hey guys hope you get your gear back from whatever low lifes knocked it off. Good run, making progress…hope to see a few more more. Thanks Greg! Unlikely to see the gear again but we’ll be out again undeterred on 9th August.